Pierre-Eric Pommellet, Executive VP, Defence Missions Systems at Thales, exchanging BTSL for joint development of PHAROS fire control radar with S K Sharma, Chairman & Managing Director, Bharat Electronics Limited; in the presence of Rajiv Kumar Sikka, CEO, BTSL, Eric Lenseigne, VP Marketing and Sales of Thales in the Netherlands, Antoine Caput, VP & Country Director of Thales in India, and other representatives from BEL, Thales and BTSL at Defexpo India 2016 in Goa. 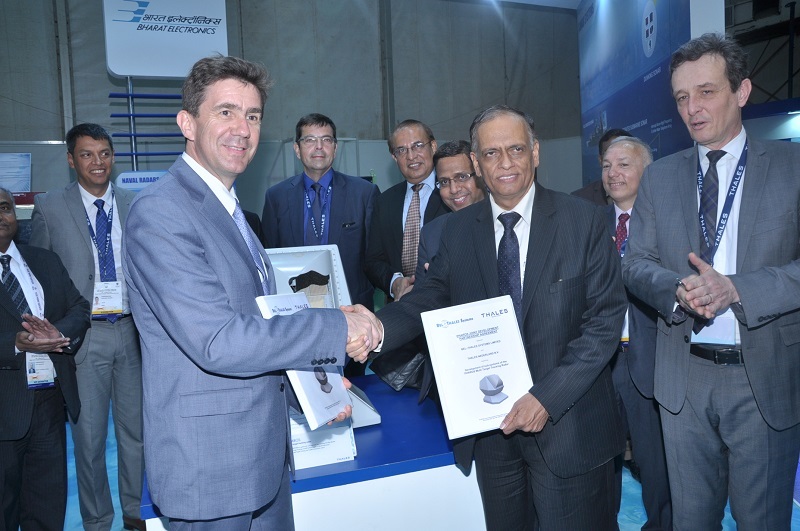 At Defexpo India 2016, Thales and BEL-Thales Systems Limited (BTSL), the joint venture between Bharat Electronics Limited (BEL) and Thales, have signed a partnership agreement for the joint development of the PHAROS fire control radar. This strategic co-operation contract will allow Thales and BTSL to jointly develop PHAROS, a fire control radar for both gun and missile systems. PHAROS provides defence against small, fast moving and highly manoeuvrable air and surface targets that may also be encountered in littoral missions. The multiple target tracker is capable of simultaneously controlling — in all weather conditions — the engagement of these targets with guided ammunition. PHAROS’ electronic beam steering capability enables multiple-target tracking and integrated guided ammunition control. PHAROS controls any medium calibre type gun, ranging from 30mm to 76mm for naval and ground-based applications. PHAROS provides defence against small, fast moving and highly manoeuvrable air and surface targets. This joint development will strengthen the co-operation of Thales and BTSL in the field of innovative technologies. The responsibility of overall system design will be borne by Thales. BTSL will develop the mechanical design and radar processing modifications while Thales will be responsible for the design and production of the radar antenna. “We are pleased to work in close collaboration with BTSL for the development of this new type of fire control sensor to address the needs of the Indian and global markets. This strategic step goes beyond the co-development partnership; it reaffirms our commitment to the country and to actively contribute to the ‘Make in India’ policy,” said Serge Adrian, Senior Vice President of Surface Radars Activities at Thales. BTSL will carry out its share of the development work in Bengaluru. This co-development agreement between Thales and BTSL is in line with the ‘Make in India’ vision of the Government of India. The jointly developed PHAROS system will cater to both domestic Indian and international market requirements.